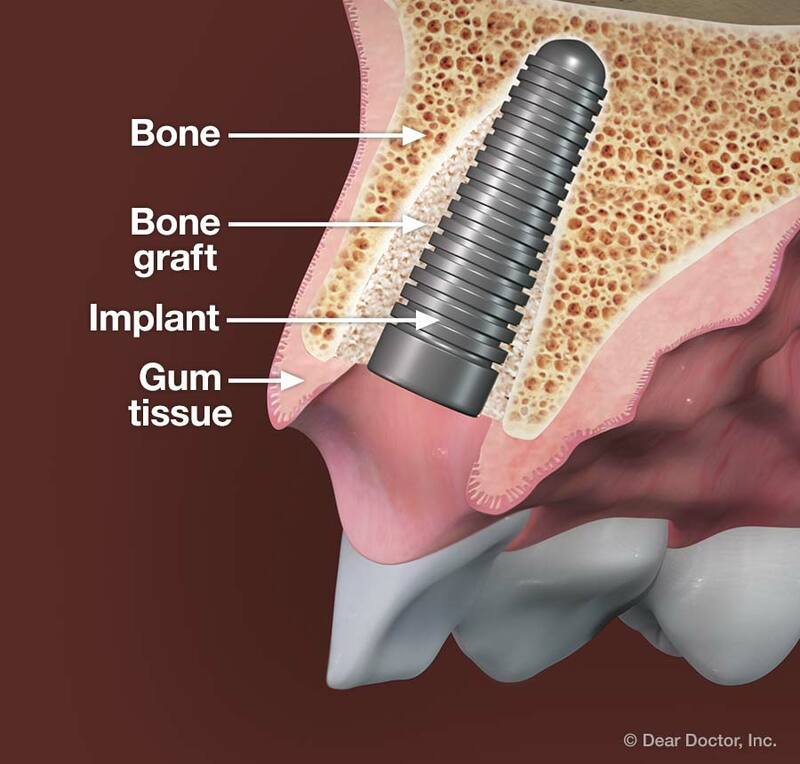 Figure 8: A bone graft helps secure a newly placed implant. More grafting material is needed on the front (lip) side, where the bone is thinnest. 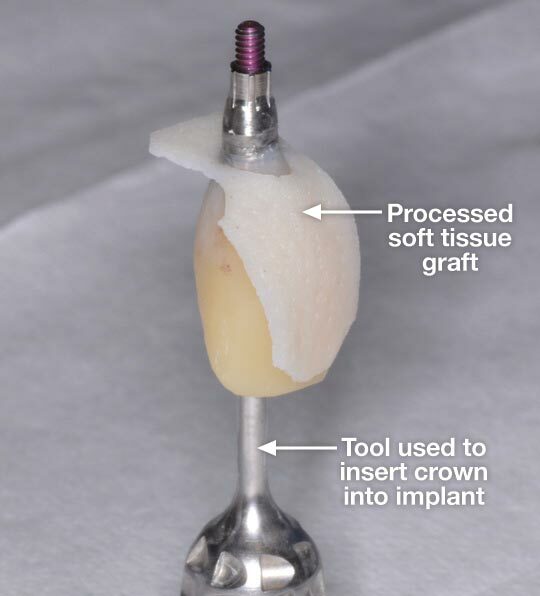 Figure 9: The implant now has its temporary crown, along with an "apron" of processed gum grafting material. This will help protect against further gum recession during healing. While it may appear solid and unchanging, living bone tissue is constantly re-forming itself, with new cells replacing older cells. Whenever a tooth is lost, the surrounding bone begins to shrink. If left untreated, bone loss in the jaw will continue, and may lead to further oral problems — including gum recession, and eventually the loss of more teeth. Numerous studies have shown that dental implants can halt the progression of bone loss; that's one reason why they are the preferred treatment for missing teeth. Research has also shown that people who receive immediate implants with supplementary treatments to enhance tissue regeneration have significantly less gum recession than those who receive no extra treatments. Today, one of these treatments — bone grafting — is a routine part of many implant procedures (figure 8). Grafting material placed in the tooth socket around the implant can reduce bone loss and aid the re-growth of natural bone. In the past, the patient's own bone tissue was harvested for this use; today, it's more common to use processed tissue from a human donor, or processed bone material from an animal that is sterile and safe for human use. Special barrier membranes made of natural or synthetic materials can also be placed in the area where bone growth is desired. These membranes are used in a technique called Guided Bone Regeneration (GBR). Having sufficient good-quality bone tissue is important to ensure that implants are solidly anchored in the jaw. It's also crucial for the long-term maintenance of healthy gum tissue. Research shows that a bone thickness of about 2.0 millimeters is needed to prevent gum recession around implants. When this amount of bone isn't naturally present, it can be augmented via the techniques of bone grafting combined with GBR. In addition to bone, soft tissue (gum) health is also very important for successful implant therapy — especially in the visible areas of the mouth. Here, even minimal shrinkage of gum tissue will be highly noticeable. 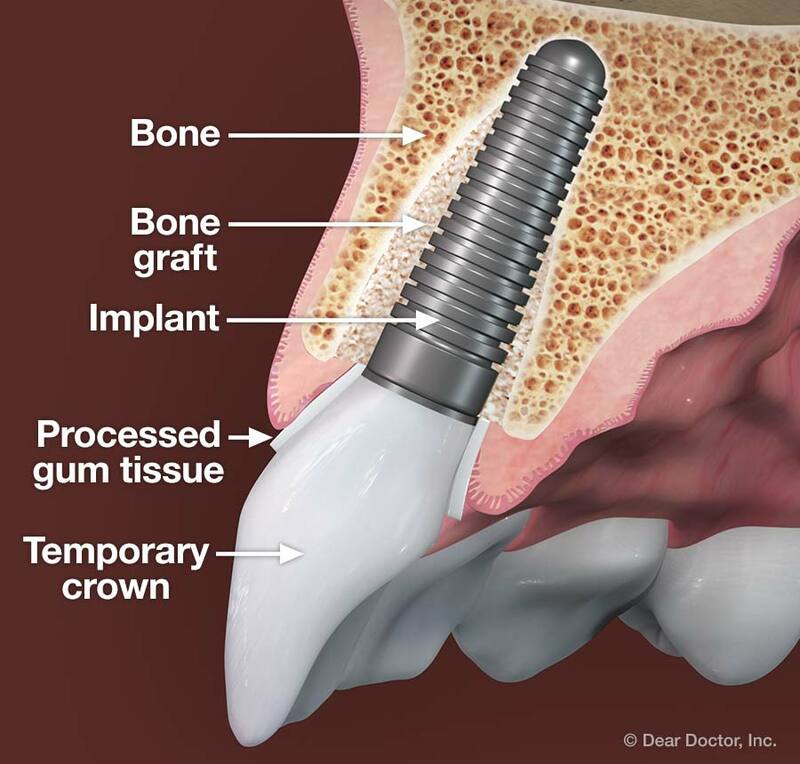 Gum tissue begins to attach to the implant as soon as it is placed, at the same time that osseointegration is occurring. Maintaining healthy soft and hard tissue can affect the success of the implant, both aesthetically and functionally. Figure 10: A lifelike crown (replacement tooth) is ready for insertion into the implant. It is partially covered by synthetic gum tissue (the dermal apron), which will be inserted below the existing gum tissue. The excess dermal apron will be removed once the crown is in position. Whether or not an immediate tooth replacement is chosen, gum tissues often require augmentation for the long-term preservation of their anatomy and healthy appearance. In places where gum tissue is naturally thin, having a soft tissue graft at the time of implant placement generally results in greater bone preservation. Research shows that the augmented sites maintained a comparable level of bone with sites that had naturally thicker tissues. Soft tissue grafts are especially valuable in preventing gum recession around implants in the front of the mouth. There are several methods for obtaining and using soft tissue grafts. A thin layer of a person's own gum tissue can be removed from another location in the mouth and surgically attached where it's needed: This is called an autograft. Although highly successful, this procedure requires a second surgical site, which sometimes causes discomfort. It is especially suitable for people who have gum tissue that is naturally thin, and has been shown capable of preventing gum recession in the long term. As is the case with bone tissue, it's also possible to use processed material from a human donor instead of taking your own gum tissue, thus avoiding a second surgical site: This is called an allograft. The inert, processed grafting material does not contain cells and blood vessels, which means it is significantly slower to incorporate in its new location; however, it does eliminate the need for a second surgery (figure 9). Soft tissue grafts are especially valuable in preventing gum recession around implants in the front of the mouth. A grafting procedure I have used successfully in immediate tooth replacements is called the "dermal apron" technique (figure 10). Here, a composite mixture of sterile processed bone material is placed in the tooth socket at the same time the implant is being placed. Then the temporary crown is attached, and donated soft-tissue grafting material is adapted to augment the tissue around it. This technique can increase the thickness of the gum tissue and help preserve underlying bone, while reducing the need and discomfort of the second surgical site associated with autograft harvesting. Dental implants can be successfully used in many different situations. But when they are used to support replacement teeth in highly visible locations, both strength and aesthetics become paramount concerns. There are several steps in the implant procedure, which may include tooth extraction, implant placement, and attachment of temporary crowns. Depending on each person's unique circumstances, these steps may be staged over months, or may be done at the same time. Your implant team will recommend a treatment plan based on your individual needs. But whether or not a replacement tooth is placed immediately, the long-term stability of the hard and soft tissues is critical to an implant's success. Both types of tissues often require augmentation, to help them stay healthy and allow them to maintain an adequate size. Using proven techniques of tissue regeneration, implants can be placed with excellent results — even in the most aesthetically demanding areas.